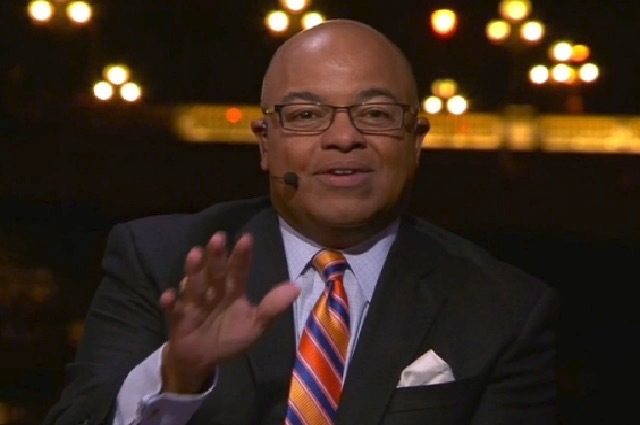 Mike Tirico signs off ESPN: "Thank you for letting us in your house"
Mike Tirico’s on-air goodbye for ESPN came approximately an hour later than scheduled, but it was no less classy and touching a farewell to a personality that’s been a integral piece of the network for 25 years. Thanks to Portugal and Poland going to extra time and a 1-1 tie in their Euro 2016 quarterfinal match on Thursday, Tirico’s signoff and the tribute from his colleagues was delayed a bit from 5:30 p.m. ET to 6:30. But somehow, that seems appropriate since the network and viewers probably weren’t quite ready to let go and fully accept that Tirico is going to NBC Sports. The video, which is hopefully soon made available online, showed footage of a young Tirico anchoring SportsCenter and ESPNEWS, testimonials from colleagues including Chris Fowler, Tom Rinaldi, Jon Gruden and producer Mark Gross. Above all, the feature was a reminder of how diverse Tirico was as a broadcaster during his 25 years at the network, calling and hosting NFL, NBA, college football and basketball, golf, and tennis broadcasts. He reported from the Daytona 500, called a game at Virginia Tech after the tragic mass shootings on campus, the first New Orleans Saints after the Superdome was re-opened following Hurricane Katrina, and did the play-by-play for Kobe Bryant’s final NBA game. The rest of ESPN’s Euro 2016 studio crew — including Taylor Twellman, Julie Foudy, Steve McManaman, Michael Ballack and Vincent Kompany — came on stage to join in the celebration and congratulate Tirico. We often love to criticize ESPN for what they do wrong or when their coverage falls short. But this was a nice, touching moment for one of their stalwarts, handled with class. Thank you to all who have made these 25 years so incredibly enjoyable. It's been an honor to be part of the special @espn family. UPDATE: ESPN has indeed posted its tribute video to Tirico online. Take a look. Ian is an editor for Awful Announcing and The Comeback. He has covered baseball for Yahoo! Sports, MLive.com, Bleacher Report and SB Nation, and provides analysis for several sports talk radio shows each week. He currently lives in Asheville, NC.